Congratulations to Paul Gamache and his award of being named the 2016 Fly Fisher of the Year! Congratulations also to Dave Hiromoto for being named the recipient of the 2016 Dry Fly Award! There is no Club Meeting this month. See you next month on the FOURTH THURSDAY at the Tracy Transit Station... yes, our "old" digs... we're moving back... and yes, refreshments will once again be served! February 4: Annual Planning Meeting - 9 am at the Banta Inn. All members are welcome. February 23: Club Meeting - 7 pm at the TRACY TRANSIT STATION. This month's speaker is Jeff Currier presenting "Fly Fishing Warmwater - Bass, Pike, Carp and More". February 24 - 26: The Fly Fishing Show - Alameda County Fairgrounds in Pleasanton. (the 23rd) for the monthly club meeting. This month's guest speaker will be Jeff Currier who is in town for the Fly Fishing Show (Friday the 24th - Sunday the 26th) at the Alameda County Fairgrounds in Pleasanton. Despite all the different species of fish out there to catch on a fly most anglers only fly fish for trout, salmon and char. They’ll drive right past the neighborhood bass pond and then travel four hours to fish a crowed river on opening day. Just the thought doesn’t make sense to Jeff and because of this he’s made it a personal campaign to share his passion of fishing for warmwater fish species. “Warmwater Fly Fishing – Bass, Pike, Carp and More” not only encourages you to give some new fish species a try but also teaches tactics for many fish such as smallmouth and largemouth bass, pike, carp and more. Learn the best flies, what rods to use and what leaders work best. You’ll be amazed at Jeff’s gorgeous fish photos and entertaining stories about some incredible fish that very possibly live down the street from you! March 1: Board Meeting - 7 pm at Perko's Cafe. The meeting is held in the "back room" of the cafe and ALL members are welcome. March 16: Club Meeting - 7 pm at the TRACY TRANSIT STATION. This month's speaker is Lance Gray presenting "Breaking Down Stillwater". This is Lance's newest presentation and is 100% different than any of his others you may have attended. Lance will show us how to breakdown stillwater, look for the transition zones and pick which weapon out of your tool bag to use to get to the fish to eat. A great new concept in providing fly fishers the information they need. Lance and Kirsten Gray have more than 50 years combined experience in fly fishing. Lance started fly fishing with his father and brother Lincoln at age 7. In his teens, Lance began tying flies commercially for shops all around Northern California. At 17, he went to work at Powell's in Chico, working in the fly shop and building rods. He guided for Powell’s, conducted fly-tying and fly-fishing schools, and traveled. In 2003, Lance and Kristen launched Lance Gray & Company, a full-service outfitter offering guided trips, fly-fishing schools, workshops and a travel agency. Lance conducts presentations at fly clubs and outdoor shows and supports local groups like Cub Scouts and 4H. He's a signature tier for Aqua Flies, pro staff member for Sage and Rio and is a featured writer, with articles published in Angling Trade Magazine, California Fly Fisher, Fly Fishermen, Sierra Fisherman and Northwest Fly Fishing. April 4: Board Meeting - 7 pm at Perko's Cafe. The meeting is held in the "back room" of the cafe and ALL members are welcome. Sorry if you missed it.. the meeting was rescheduled to a day earlier than usual. April 20: Club Meeting - 7 pm at the TRACY TRANSIT STATION. "Fly Fishing 101". April 26: Fly Casting Instructions - 6 pm at Dr Powers Park. Casting instructions led by Chuck Robbins, a Federation (FFF) Certified Casting Instructor. Lessons are held on the lawn behind the swimming pool. May 3: Board Meeting - 7 pm at Perko's Cafe. The meeting is held in the "back room" of the cafe and ALL members are welcome. May 6: Club Outing - Shadow Cliffs Regional Park. May 18: Club Meeting - 7 pm at the TRACY TRANSIT STATION. 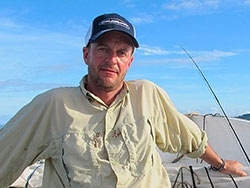 This month's guest speaker is Craig Gittings teaching us all just how easy it is to fish Cuba! May 18-19: Delta Bass 'n Fly Tournament. Bethel Island - Sugar Barge. Blast-offs at 6 am, weigh-ins at 2 pm. May 24: Fly Casting Instructions - 6 pm at Dr Powers Park. Casting instructions led by Chuck Robbins, a Federation (FFF) Certified Casting Instructor. Lessons are held on the lawn behind the swimming pool. How in the world does one get sucked into a such a deal? A trip to the forbidden Caribbean country of Cuba would be a trip of a lifetime for most of us. Craig’s daughter had studied in Havana via a study abroad program at Davis. Matt Herron had also provided the club with his perspective with his trip to southern Cuba. How difficult could a fishing trip be? When a fishing buddy suggested the trip as a father son trip, it was all down hill from there. A Santiago, Chile travel agency hooked us up. Monies were sent, then the added costs were presented. A donation to Oceans Foundation was sent off for an authorization letter to fish the waters in Cuba under a research and monitoring program. Then the voice of reason kicked in. I am referring to my money manager and better half. As far as she was concerned the money was pissed away via an internet scam. How could I be so gullible? There was a Facebook page that promoted his company with years of trips under his belt. My wife claimed anyone could doctor up Facebook page as such. It was money lost and the ship had sailed. How could that be the case as no Nigerians were involved or so I thought? Avalon Fly Fishing, an Italian venture in Cuba was the avenue to participating in such a wild scheme. But monies wired to a New York banking account that got bounced because the numbers did not jive. Were we taken as my wife suggested? Even I had my doubts and regrets prior to the trip. The other anglers were father and son teams from Santiago, Chile and Tierra Del Fuego, Argentina. When we got to the Miami International Airport, we felt we were in a different country already. Thankfully, I knew how to say, “ Lo siento. No hablo espanol,” when approached at the airport. What had we gotten ourselves into? Find out at the next club meeting. June 14: Board Meeting - 7 pm at Perko's Cafe. The meeting is held in the "back room" of the cafe and ALL members are welcome. This month only the meeting will be held on the second Wednesday due to Board Member vacations. June is a "silent month"... there will be no general Club Meeting. June 22 - 25: Club Outing - Davis Lake. Contact Bob Kiffin or Pat Ferguson for more information. General information can be found by clicking here. July 15: Membership Family Picnic - 11 am. Once again we'll be serving up delicious Lockeford Sausages. Everyone is encouraged to bring a side dish to share (salads, chips, cookies, etc). The picnic will once again be held at the Tracy Wildlife grounds at 12222 Finck Rd in Tracy. August 2: Board Meeting - 7 pm at Perko's Cafe. The meeting is held in the "back room" of the cafe and ALL members are welcome. August 17: Club Meeting - 7 pm at the TRACY TRANSIT STATION. This month's guest speaker is Mark Cottrell. August 24: Casting Instructions - Chuck Robbins our Federation of Fly Fisher's certified Casting Instruction will be on hand at Dr. Powers Park in Tracy beginning at 6 pm. No prior experience required to attend... open to all... bring a friend! Casting takes place on the lawn area behind the swimming pool. commercially for more than 35 years. September 6: Board Meeting - 7 pm at Perko's Cafe. The meeting is held in the "back room" of the cafe and ALL members are welcome. September 21: Club Meeting - 7 pm at the TRACY TRANSIT STATION. This month's guest speaker is Sam Sedillo of Trout Unlimited. September 28: Casting Instructions - Chuck Robbins our Federation of Fly Fisher's certified Casting Instruction will be on hand at Dr. Powers Park in Tracy beginning at 6 pm. No prior experience required to attend... open to all... bring a friend! Casting takes place on the lawn area behind the swimming pool. Sam Sedillo works for Trout Unlimited as the Sierra Cascades Field Coordinator out of the Truckee TU (TRTU) office. He works on restoration projects, volunteer operations, fish sampling, and outreach. Sam will be presenting on how TU is leading projects to conserve, protect, and restore trout and salmon fisheries throughout California. TU is excited to be working on projects that both directly benefit the special fish that exist in the state and also provide increased opportunities for anglers to catch these fish. Moreover, Sam will be talking about how to fish two of the rivers that Trout Unlimited is invested in, the Truckee and Little Truckee Rivers. Sam moved to Truckee from Colorado two years ago, where he completed his degree in Natural Resources Management and Fishery Biology from Colorado State University. He’s an avid fly fisherman and spent the majority of his angling career there fishing for trout with tiny flies in tailwaters. This, to nobody’s surprise, prepared him for spending most of his days on the water in California fishing for trout in tailwaters with tiny flies. October 4: Board Meeting - 7 pm at Perko's Cafe. The meeting is held in the "back room" of the cafe and ALL members are welcome. October 19: Club Meeting - 7 pm at the TRACY TRANSIT STATION. Greg Vinci will be our guest speaker presenting "American River Steelhead". October 26: Casting Instructions - Chuck Robbins our Federation of Fly Fisher's certified Casting Instruction will be on hand at Dr. Powers Park in Tracy beginning at 6 pm. No prior experience required to attend... open to all... bring a friend! Casting takes place on the lawn area behind the swimming pool. This is the last chance this year to participate due to the time change back to Pacific Standard Time. Chuck will return in the spring of 2018 following the time change back to Daylight Savings Time. in the wholesale fly fishing tackle industry, Greg began a new career contributing photography and articles to national outdoor magazines. Magazine, Fly Rod & Reel Magazine, American Angler, Northwest Fly Fishing Magazine, Southwest Fly Fishing Magazine and Runners World to name a few. Subjects have ranged from historical articles to fly fishing and travel. Several of his photos have appeared on covers of these magazines. His book “Flyfisher’s Guide to California” was published by Wilderness Adventures Press in November 2015. Greg's presentation for this month's club meeting will be "American River Steelhead". Northern California’s American River is one of the southern most reliable trophy Steelhead fisheries in the northern hemisphere. The size of the fish are large and they return each winter like clockwork. The American also hosts annual runs of “half-pounder Steelhead” and good runs of American Shad and Stripped Bass. All of this in one of the most densely populated cities in the state. the best holding water for Steelhead. Fly patterns and techniques are covered along with lots of maps to provide orientation as we proceed. to regular visitors that have not had a chance to explore the whole fishery. November 1: Board Meeting - 7 pm at Perko's Cafe. The meeting is held in the "back room" of the cafe and ALL members are welcome. (Who knew it was also gong to be Game 7 of the World Series!). November 16: Club Meeting - 7 pm at the TRACY TRANSIT STATION. 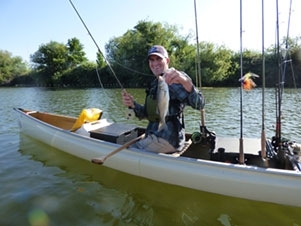 Bill Beckett will be our guest speaker presenting flyfishing opportunities from a kayak. fishing mountain streams with his dad in the Trinity Alps. and college while he studied to become a Fisheries Biologist. Bill is currently the manager of Headwaters Kayak Shop in Lodi. fishing the Delta and the Northern California coast. close to the boiler rocks for rockfish and lingcod. passion for kayak fly fishing with others. is the common thread that unites us as fly anglers. December 6: Board Meeting - 7 pm at Perko's Cafe. The meeting is held in the "back room" of the cafe and ALL members are welcome. December 21: Club Meeting - 7 pm at the TRACY TRANSIT STATION. The annual meeting of the membership where you can cast your vote for next year's Club Officers. Also a chance to share your memories from this past year in the member slideshow.